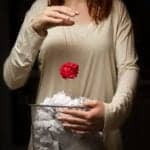 When it comes to designing and decorating your home, your laundry room or space probably comes dead last on your to-do list. 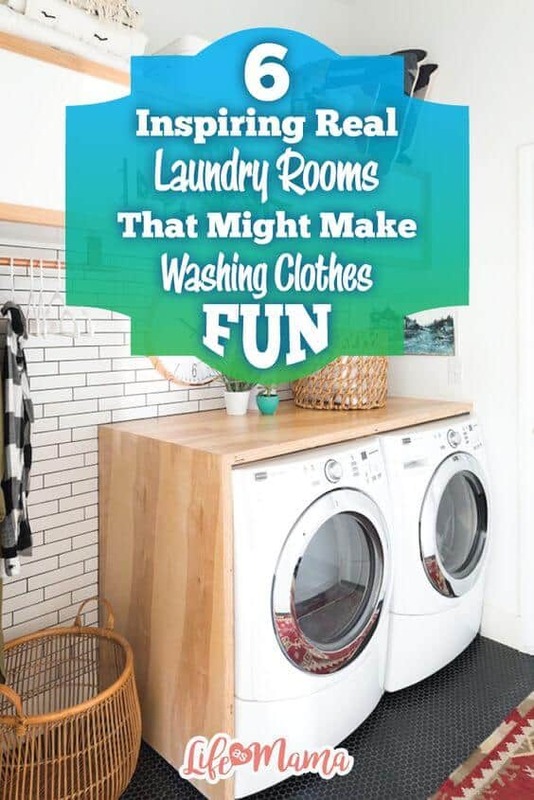 As long as it contains everything you need- washer and dryer, enough detergent to clean an army, and maybe even a place to fold clothes, you’re probably pretty satisfied with it. 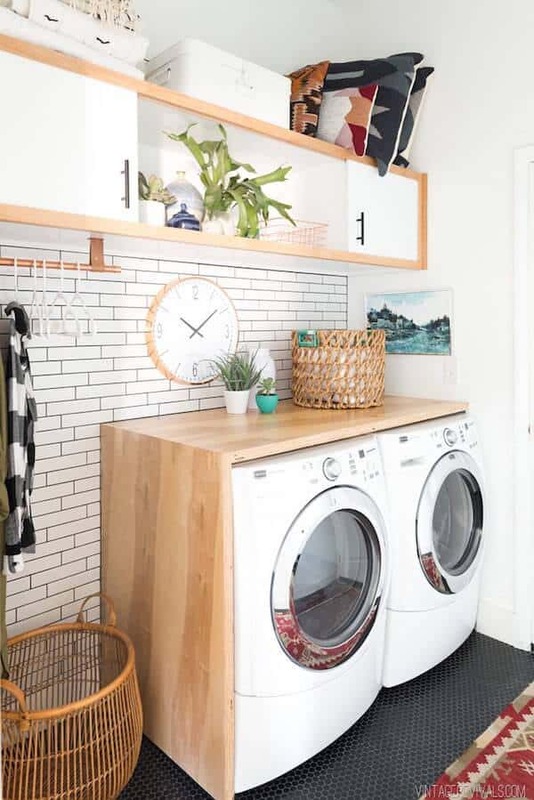 Still, that probably doesn’t stop you from dreaming of having a laundry room stylish enough to adorn the pages of your favorite home design magazine. 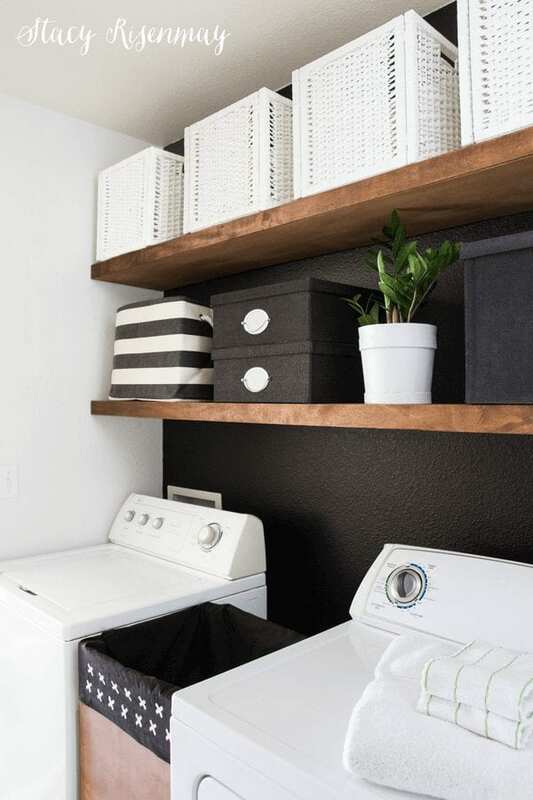 These real life laundry rooms show that you don’t need to have the most updated equipment or even the biggest space in order to outfit your home with a laundry room that makes the task of washing clothes a little more enjoyable. 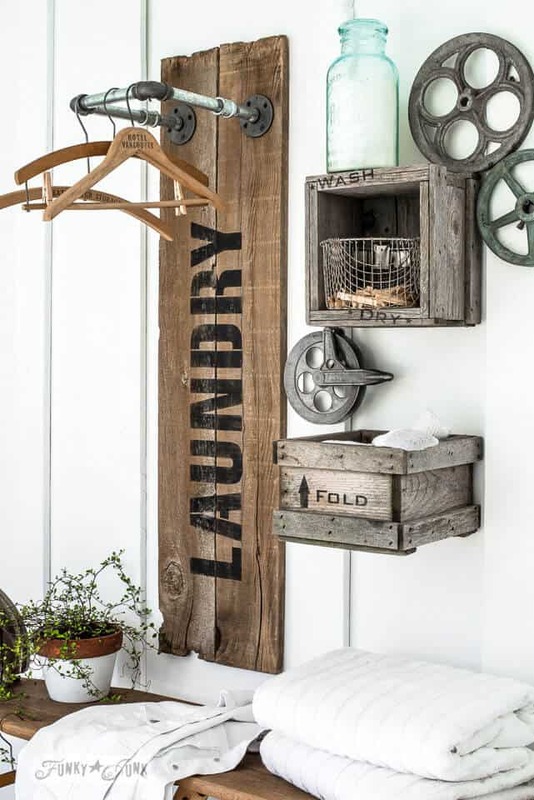 This laundry is a fantastic blend of textures and patterns that work perfectly with each other. 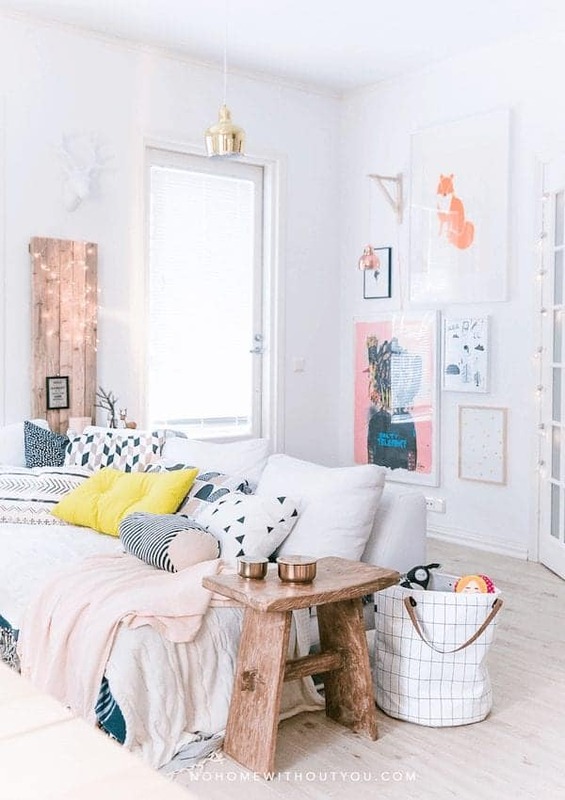 All sharing a neutral cream and white color scheme, this room is sweet and relaxing. The paneled wall and hanging chandelier give the entire space a sort of rustic elegance that looks absolutely stunning. 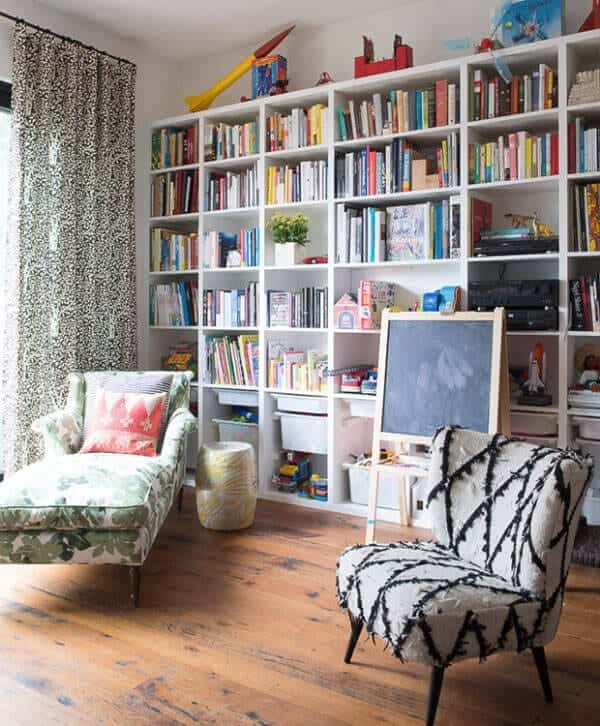 Visit Right Up My Alley to find tons of inspiring home design and decor projects. When in doubt about a particular color scheme, go with monochrome. The simple black and white gives any space a modern vibe that can easily be added to with colorful accessories. This room makes the white machines the focal point by painting the wall behind them a deep black and leaving the others neutral white. The presence of the black and white accessories on the wooden shelves only add to the cool but simplistic scheme. 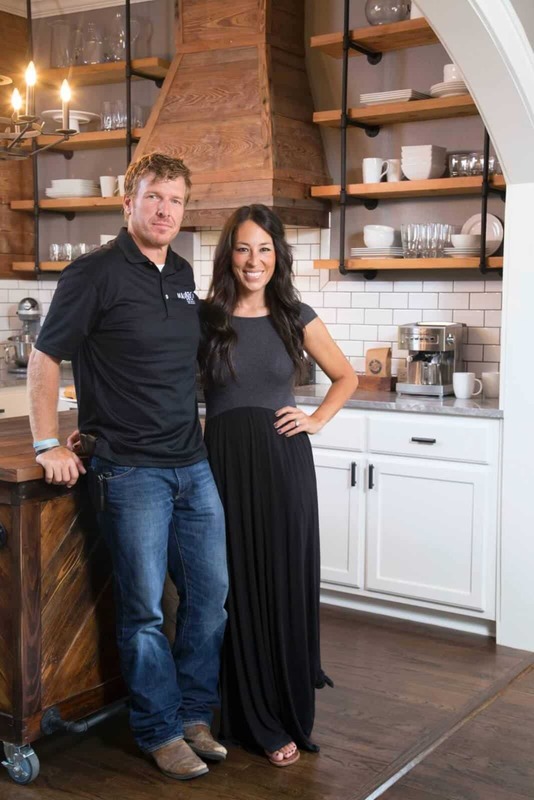 Get all the home improvement inspiration you’ll ever need at Not JUST A Housewife. 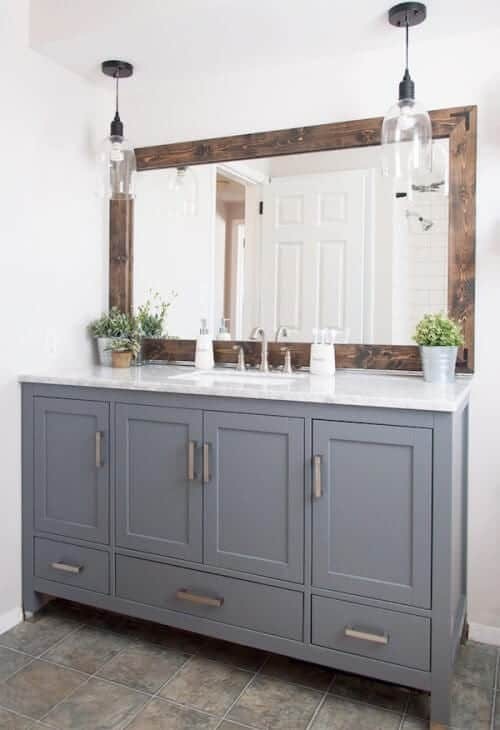 As a beautiful homage to the clean, slightly rustic style, farmhouse chic never seems to get old. The gorgeous white tile and white paneled walls provide a bright, simplistic backdrop that is only enhanced by the slight pops of color and wood topped shelves and tables. Get inspiration for creating the home of your dreams at Twelve On Main. 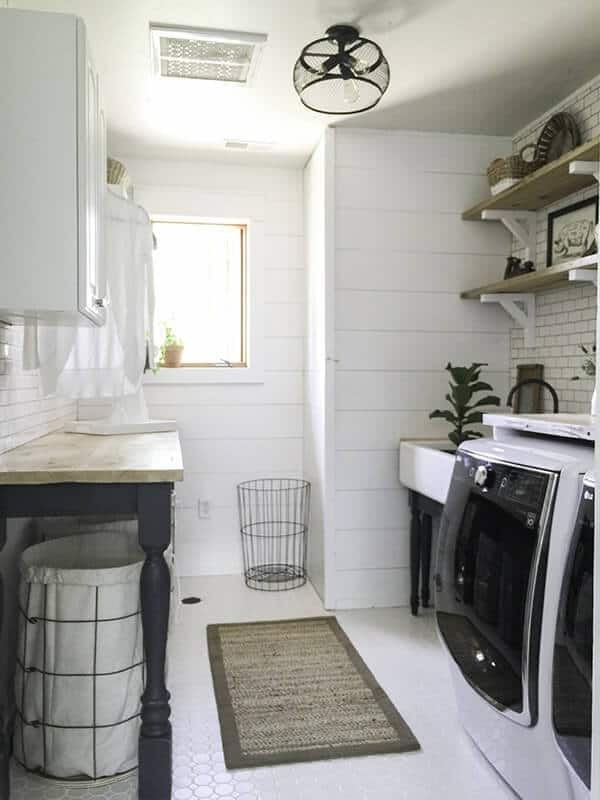 Another laundry room with a more simplistic vibe that is as far from boring as possible, this room takes advantage of dark tile on the floor and wood accents to set it apart from the rest. Find tips and tutorials for transforming old items into beautiful new pieces at Vintage Revivals. 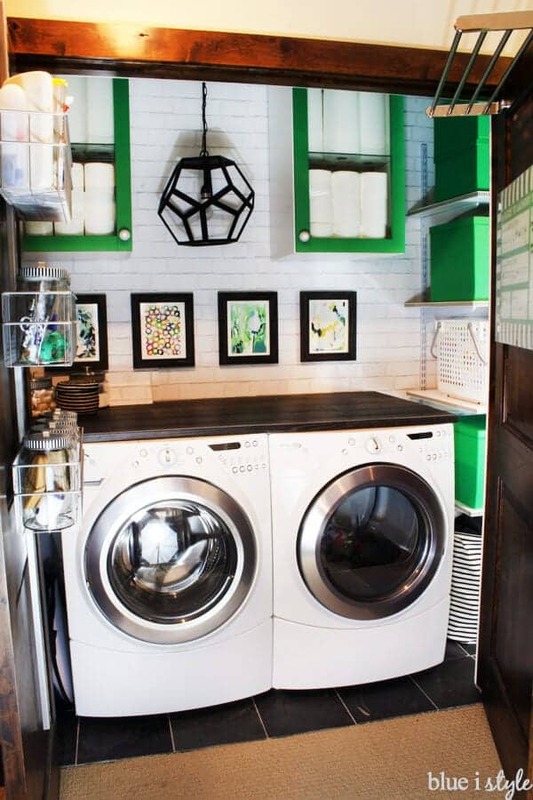 The fun, whimsical designs on the washing washer and dryer as well as the adorable prints and muted but beautiful pops of color make this laundry room extremely unique. 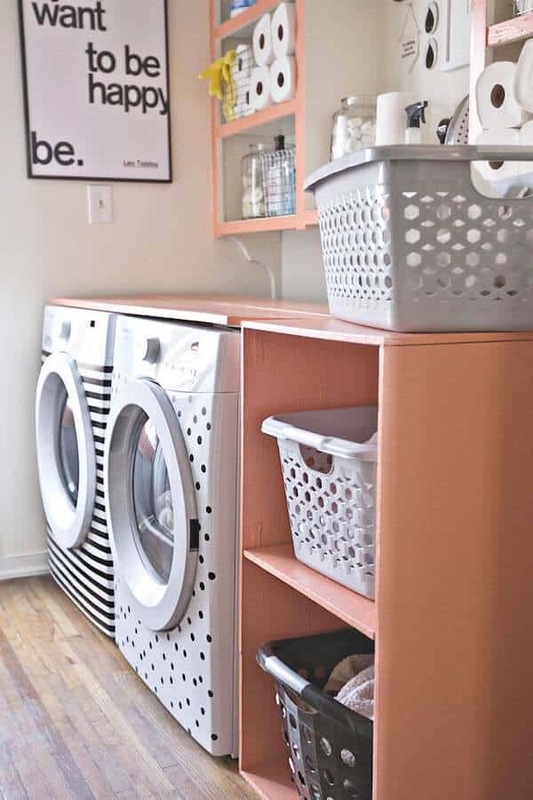 The machine designs are created with electrical tape while the peach accent spots add tons of personality and some much-needed vibrancy. Get great recipes, fun DIY’s, and fashion inspiration at A Beautiful Mess. 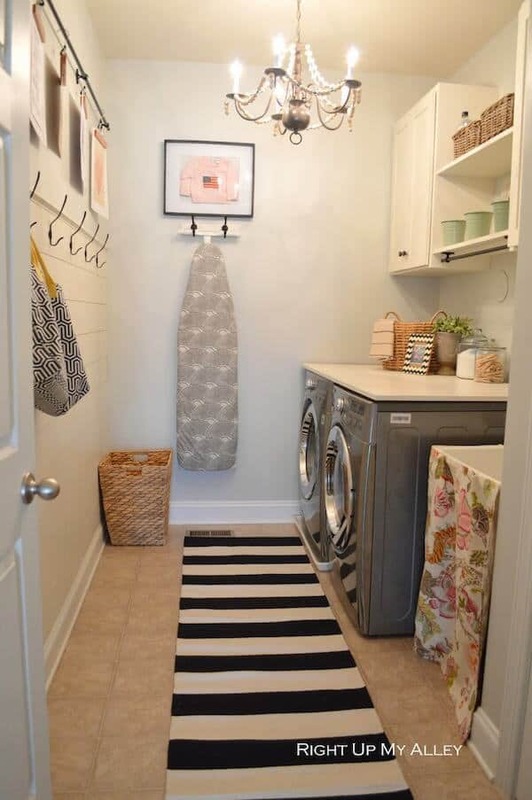 This laundry room perfectly shows that you don’t need a large space to make your laundry area shine. 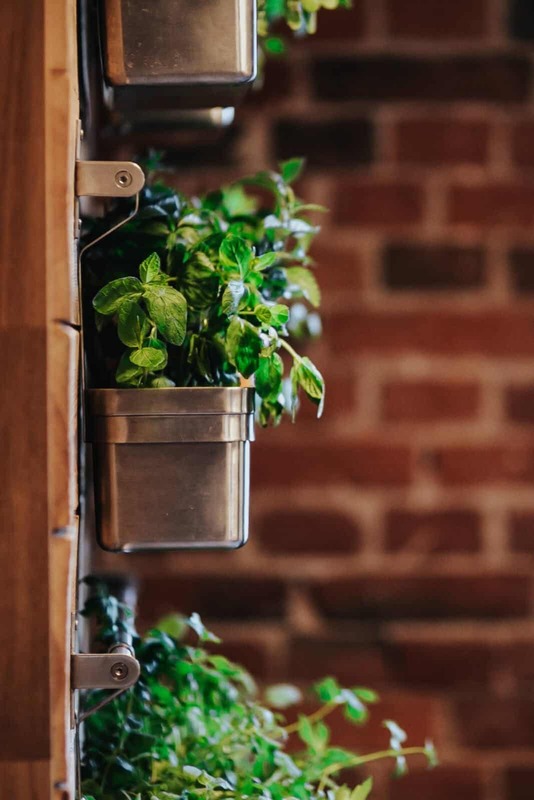 The area is utilized perfectly, with storage and other necessities placed on the insides of the doors while the green shelving, white backdrop, and black floors offset each other perfectly, creating a gorgeously eye-catching space. Find tips on organizing your home, creating crafts for your kids, and hosting for the holidays at Blue i Style.